The drive to the pristine forest surrounding Pedu Lake in Kedah takes more than two hours from my home state of Penang. If it is foggy along the way, you can expect a delay. And it was certainly foggy today. My companion this time, Choo Eng, had his driving skills tested and we reached our destination slightly later than usual but in one piece. Once there, all the fog has evaporated and was replaced by a bright sunny day. 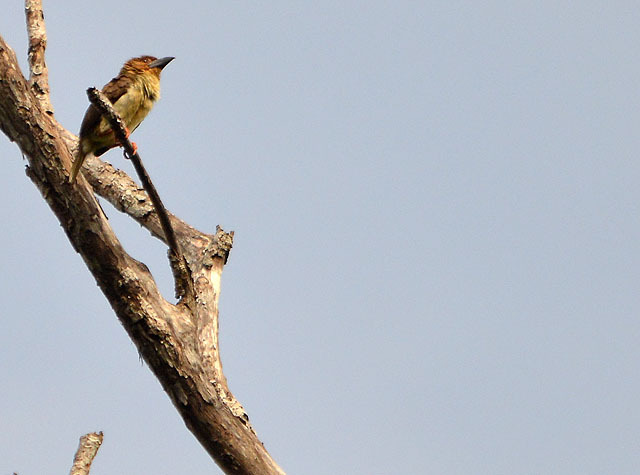 A swarm of winged termites will usually attract a horde of insectivorous birds but unfortunately, not today. Quite a number of birds did pass through the area but most were simply too high above to warrant any photographic attempts. A pair of Buff-rumped Woodpeckers finally gave me a reason to lift up my camera as they wandered slightly lower than the rest. This small woodpecker is strikingly plumaged but the plumage also acts an effective camouflage. From this angle, where the bird is most vulnerable to predators, the little drummer almost blends into its surroundings completely. 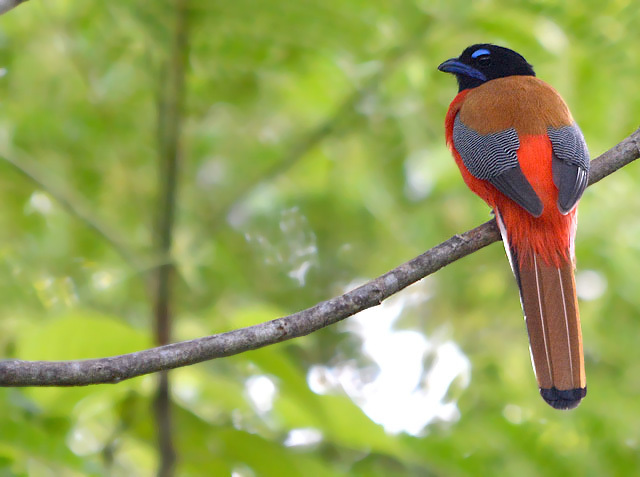 The unmistakeable call of the Scarlet-rumped Trogon momentarily diverted our gaze from the tall trees and towards the middle storey of the forest. We managed to trace the call back to its source and it was a handsome male. Resting on an exposed perch and showing off his namesake, this turned out to be the best photo of the trip. 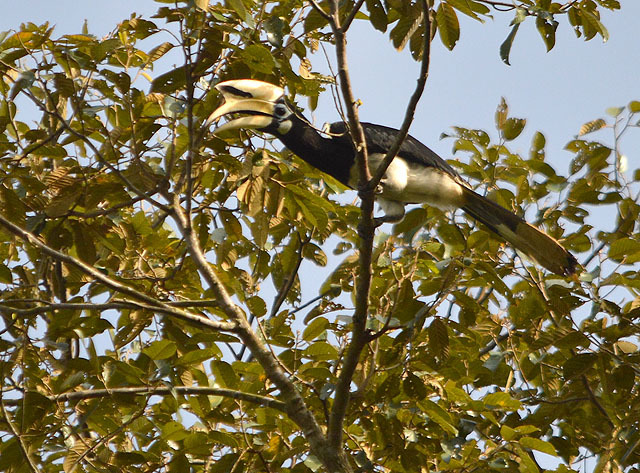 The Oriental Pied Hornbill can be quite confiding in certain areas of its distribution in Malaysia. The population in this Pedu Lake area does not fall into that category. Good views are surprisingly hard to obtain despite audio contacts on every visit. I guess I can consider myself lucky to see this male bird perched on the topmost part of the canopy. This species lacks the majesty of its bigger relatives but it is a hornbill nevertheless. And there was no shortage of respect and admiration from me during the encounter. The Sooty Barbet is peculiar among barbets for not having a single speck of green on its plumage and instead of calling like a barbet, it sounds more like a mouse. And to top it all off it is no where as sluggish as any barbet and moves about actively in a flock. The Sooty Barbet definitely does not give in to conformity. A flock was having a little midmorning siesta on a huge dead tree when I chance upon them. Knowing fully well that the distance was too great for me to be a threat, they totally disregarded my presence and my frantic movements to try and make the best out of the situation. That pretty much sums up today’s trip. The birds were certainly up and about – with emphasis on up. They were way too high up in the canopy for me to make anything out of most of the encounters. 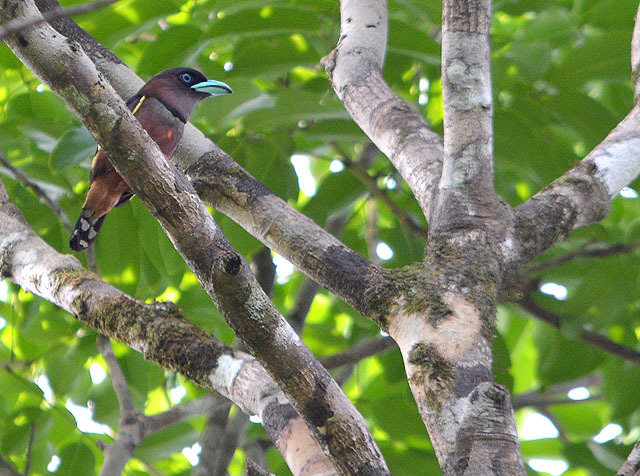 I have been wanting to obtain a decent photograph of the Banded Broadbill for as long as I can remember. I came across a male bird today and he was quite obliging. I only had one little issue – I have yet to master the skill levitation and this the best that I could muster. At the end of the access road we frequent lies the now abandoned Mutiara Pedu Lake and Golf Resort. Today, the vicinity provided a daytime sighting of an owl. 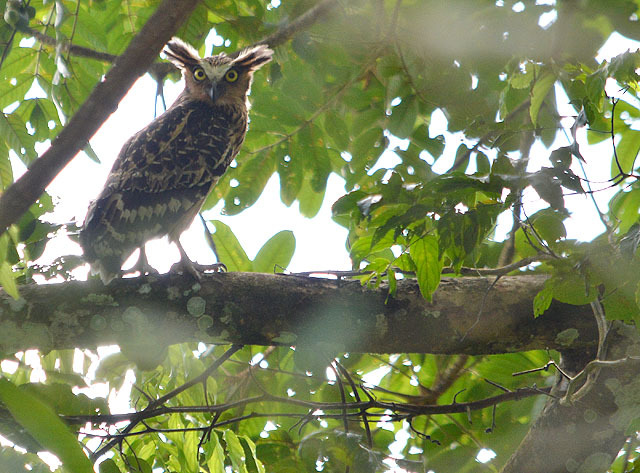 Regardless of species, it is always exciting to encounter these nocturnal predators in broad daylight – even if it is just a Buffy Fish-owl. Needless to say it was way up in the canopy as well. Compounded by strong backlight, there was nothing much to be obtained here except for a momentarily exhilarating visual record. 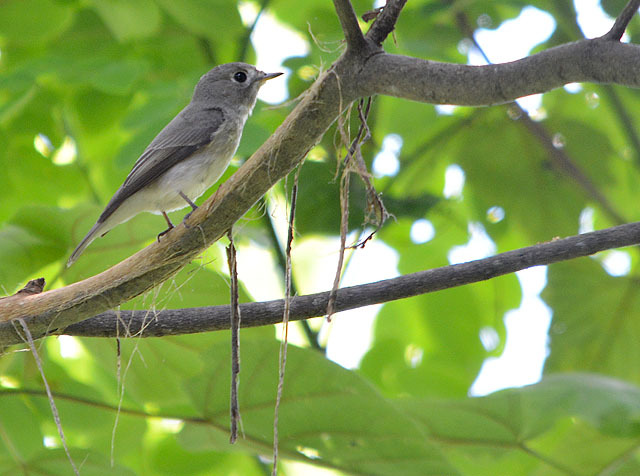 With most spring migrants having undertaken their journey back north, this lone Asian Brown Flycatcher is probably one of the last few still here in their tropical winter homes. At the end of the day, the visit here to Pedu Lake did not quite satisfy my often insatiable appetite for birding. Perhaps of the great run I have been enjoying these past weeks have almost made me forgotten the feeling of having a slow and frustrating day. Well, today certainly jolted my memory but that is birding and I suppose, life as well. You take the good with the bad and carry on. Yes, Yee Ling. From this angle, it is hard to pick the bird out. 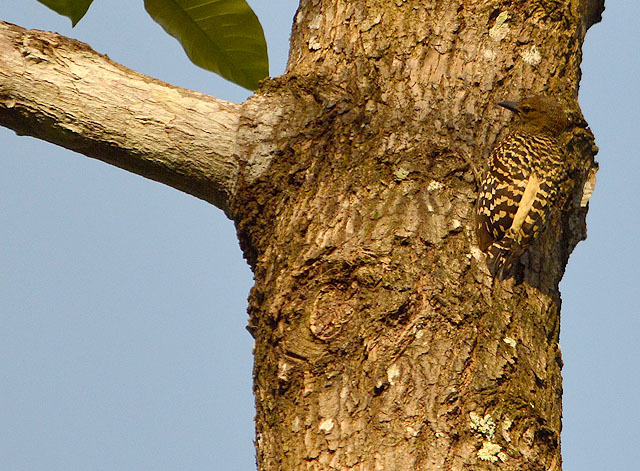 Yes a great picture of the buff rumped woodpecker hardly made out against the tree, well sighted Wai Mun. A not so visited venue also up there at the pedu Lake area and again lovely pictures. Thank you, Keiron. Hopefully my next trip there will yield better results.